Maps are cool. Scratch that, maps are amazing. We here at Zotero are always trying to think up new ways to let you play with and visualize your library. So we jumped at the chance to visualize our libraries in a maps. 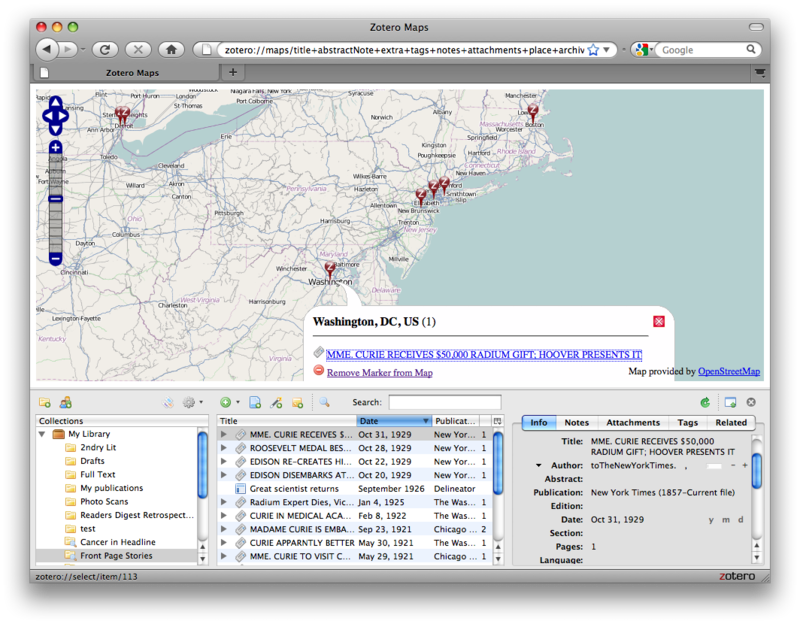 We are excited to announce the release of the Zotero Maps plugin, available here. Developed by Entropy Free LLC and the Zotero project, this plugin allows Zotero users to browse their collections through geographic relationships among their items. In other words, to map your library and use those maps as navigation for your library. You can see it in action in the image below. Once you install the plugin you can generate a map from a drop down in the Actions menu (the gear icon). 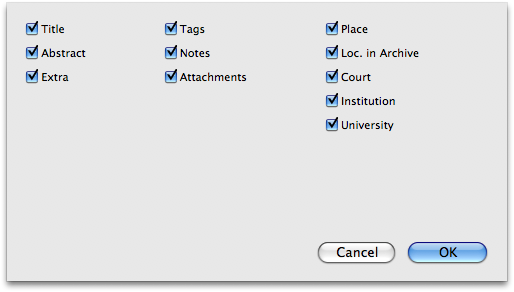 This will prompt you to chose which fields you want Zotero Maps to search through for geographic terms to Map. Once you have selected the terms, the software will generate a map in your browser window. Zotero Maps uses OpenStreetMap to construct the map, and you can pan, zoom in and out, and drag your way around the map. You can also click on any of the pins in your map to see all of the items associated with that location. What makes Zotero Maps particularly awesome is that it allows you to mine different individual information fields for place information. As shown in the image below, you can search any combination of item titles, tags, places of publication, abstracts, and your notes. Most excitingly, Zotero Maps can automatically extract locations appearing in the text of your PDFs and then plot these places on a map. Many records from library catalogs and journal databases come pre-loaded with geographic keywords. Zotero Maps lets you quickly see the relationships between the terms catalogers, authors, and publishers have assigned to the items in your collection. Similarly, as you apply your own geographic tags to items you can then explore those geographic relationships. Whether you’re looking at key locations in studies of avian flu, ethnographic work in the American southwest, or the history of the transatlantic slave trade, the tags associated with your items provide valuable geographic information. In many cases places of publication include crucial information about your items. If your working on a project involving the history of the book, how different media outlets cover an issue, or how different journals present distinct scientific points of view, the places in which those items are published can provide valuable insight. This entry was posted on Monday, May 10th, 2010 at 9:56 am by Trevor and is filed under News. You can follow any responses to this entry through the RSS 2.0 feed. Both comments and pings are currently closed.